A new National Academies report recommends steps U.S. communities can take to better measure their progress in building resilience to disasters, including measuring resilience around multiple dimensions of a community, and incentivizing the measurement of resilience. Current evidence supports the classification of the contemporary red wolf as a distinct species of wolf, although additional genomic evidence from historic wolf specimens could change that assessment, says a new National Academies report. A new National Academies report calls for different approaches to assess and manage urban flooding, which is compounded by land use and high population density as well as sea-level rise and more frequent heavy precipitation events. 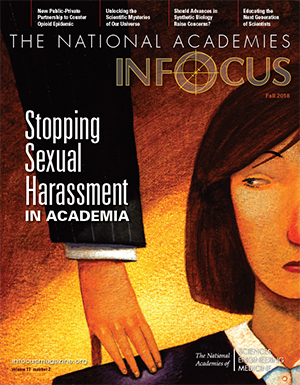 The National Academies In Focus, a magazine featuring the activities and work of the Academies.